[S64] General Record Office for Scotland, online www.scotlandspeople.gov.uk, General Record Office for Scotland (Edinburgh, Scotland), GROS Statutory Marriages 1864 Blairgowrie 335/ 26 [Oct 2017]. [S54] Website findmypast.co.uk (www.findmypast.co.uk) 1901 England, Wales & Scotland Census Transcription URL of this page: http://search.findmypast.co.uk/record?id=gbc%2f1901%2f0035216625 [June 2017]. [S64] General Record Office for Scotland, GROS Statutory Marriages 1900 Perth 387/ 52 [Oct 2017]. [S50] General Record Office for Scotland, online www.scotlandspeople.gov.uk, General Record Office for Scotland (Edinburgh, Scotland), GROS Statutory Deaths 1900 Blairgowrie ref 335/ 88, image held [Jun 2017]. 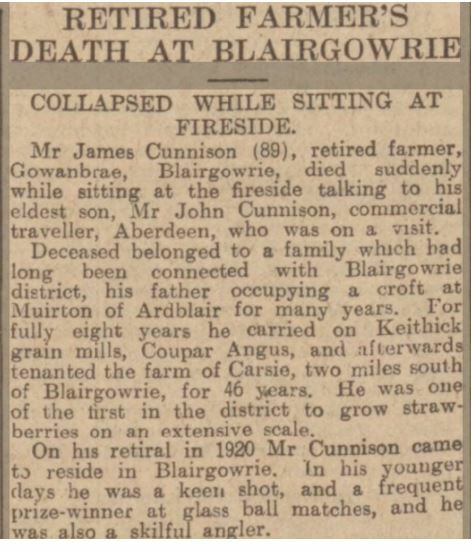 [S50] General Record Office for Scotland, GROS Stautory Death 1902 Blairgowrie 355/ 7 [June 2017]. [S54] Website findmypast.co.uk (www.findmypast.co.uk) Newspapers Collection Dundee Courier 30 Nov 1929 [Sep 2017]. [S54] Website findmypast.co.uk (www.findmypast.co.uk) 1841 England, Wales & Scotland Census Transcription URL of this page: http://search.findmypast.co.uk/record?id=gbc%2f1841%2f0018091904 [June 2017]. [S56] International Genealogical Index (IGI) (Salt Lake City, Utah, USA: International Genealogical Index), https://www.familysearch.org/ 1-4 of 4 results for Father Name: james cunnison, Mother Name: mar 1-4 of 4 results for Father Name: james cunnison, Mother Name: margaret low [Oct 2017].